GRC Door Surrounds - Abbey Artstone Limited, Manufacturer of Architectural Masonry, Semi Dry, Wetcast, GRC, GRP, Cills, heads, balustrade. Abbey Artstone Limited range of lightweight products designed for the construction industry is the only range of post fix lightweight GRC door surrounds. 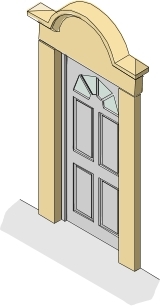 With our range of GRC door surrounds you have an alternative to traditional precast or GRP door surrounds. Our surrounds are ultra thin and lightweight which reduces labour and mechanical lifting there is also consequently very little load on the structure to which it is attached. It has a hidden fixing system with its post fix design system. Weathering of the GRC units occurs almost the same as any precast stone keeping the building constant over time. Heavy units that require mechanical lifting. Units are prone to suffering from damage by subcontractors entering the building whilst in construction. Extremely difficult to repair or replace when damaged. High maintenance cost over a period of time. A false plastic look which decreases the overall look of the property. Conspicuous fixings which are visible on the face of the product. Weathers differently in comparison to pre cast or GRC products. Deteriorates under UV light and is difficult to repair when damaged. 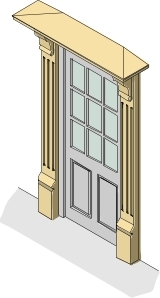 We have a wide range of head and jamb combinations to suit all designs, but we can also manufacture to customers specific designs although careful thought should be given to pattern and mould establishment costs and utilization of materials by ensuring you make full use of quantity where possible. Abbey Stone Products door surrounds are available in a wide range of colours to suit any project and to match our precast and wet cast stone materials. With over 200 special colours available to order.